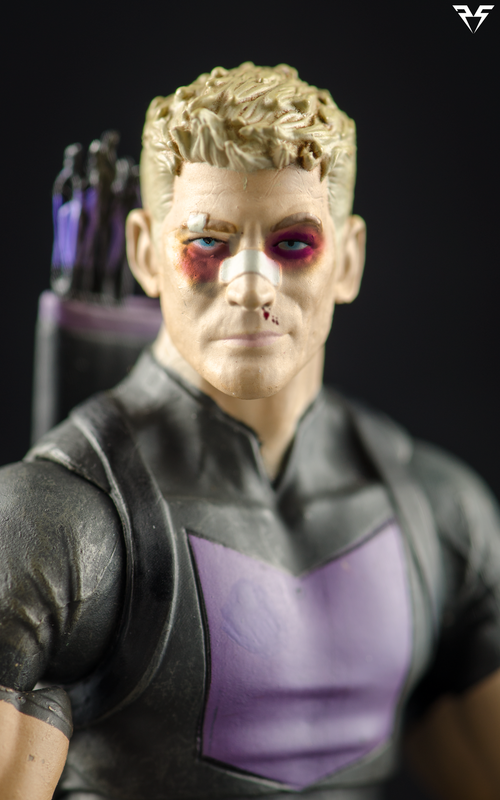 The Marvel Select "Avenging" Hawkeye figure is based on Clint Barton's look in the latest Hawkeye comic series by Matt Fraction and David Aja. These two are some of my favourite comic creators and I really liked the series they did for Ironfist. Hawkeye just ended with its run with the 22nd issue. As soon as I heard Diamond Select was going to produce a figure based on this comic series I knew I had to own it. I picked up this figure in a local Disney store here and I am incredibly happy with the final product. Instead of the traditional Masked, costumed avenger you are used to seeing, this Hawkeye is more of a casual, real world design. His paint applications are clean and his posability is above average. 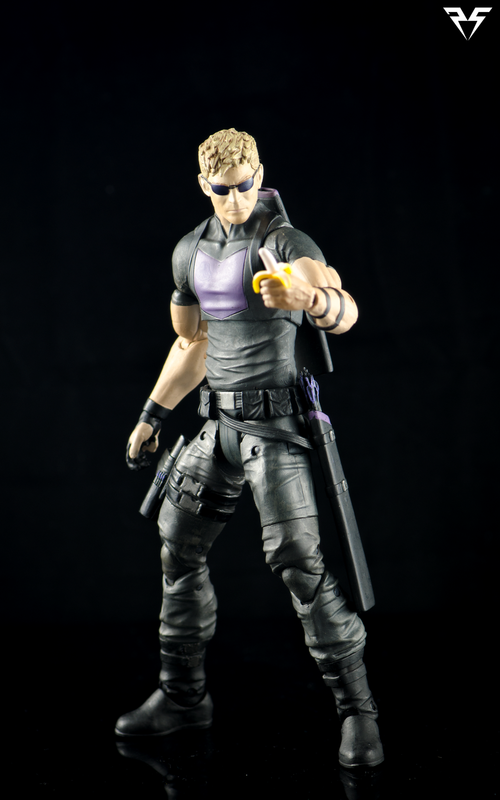 For accessories he comes with an interchangeable head, a replacement "drawing" hand, a 2 piece crossbow pistol, a compound bow, 6 assorted arrows featuring a number of the trick arrow tip designs from the comic books, and a non articulated figure of Hawkeye's dog Lucky, the Pizza Dog. There are a few points of articulation that could stand to be improved. Toy companies, please, stop making archer characters with single jointed elbows! 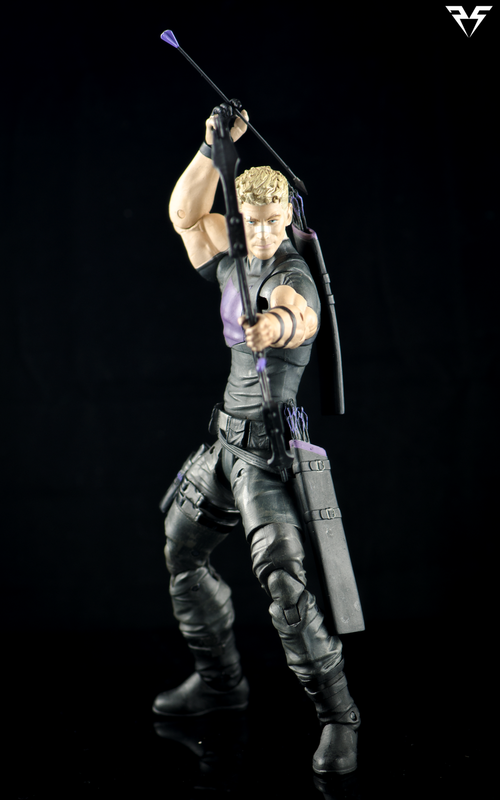 Due to his limited elbow articulation it is almost impossible to pose Hawkeye drawing or firing his bow. 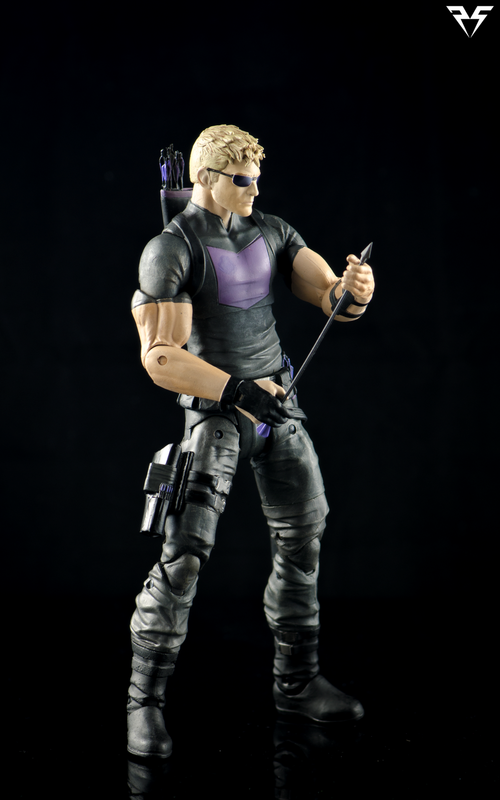 Personally, I feel the most boring thing you can do with Hawkeye would be to stand him there with his bow drawn, but he should still be able to do it. His ab crunch is very minimal as an actual crunch but it can be used for a more natural twisting motion across the main body. His legs are mostly unhindered and feature nice double jointed knees with soft ratcheting. He also has a very nice soft ratcheted ankle joint and a swivel, very similar to current marvel or star wars black series figures. His joints are strong and he can hold most poses and even balance on one leg without stands very easily for me. His arms are a bit too meaty especially in the upper arm areas but I can live with that. All in all, just like Clint Barton, this figure has a few flaws. He's not a perfect Hawkeye, but he's more than enough for me. Between the amazing recreation of the current comic book design, the modest price point and the included accessories, I can overlook a few issues with posability. I am incredibly satisfied with Marvel Select "Avenging" Hawkeye and Lucky the Pizza Dog and I would highly recommend the set to any fan of the current "Hawkguy" Hawkeye comics. Check out the gallery below for more images of Marvel Select "Avenging" Hawkeye and Lucky!